Everyone knows — or ought to know — who Shirley Temple is. Easily the most popular star during most of the later 1930s, Shirley Temple's talent in films was more than just awe-inspiring. Her presence onscreen cheered a nation still struggling with the Depression. Dropping out of showbiz in her adulthood, Shirley Temple Black found new glory in the U.S. diplomatic corps, where she eventually became Chief of Protocol. Born in middle-class comfort, Shirley's mother Gertrude encouraged her singing and acting talent, creating the ringlet "look" which became so famous. Enrolled at the Meglin Dance School in 1931, Educational PIctures casting director Charles Lamont spotted the three-year-old, and signed her to a contract. 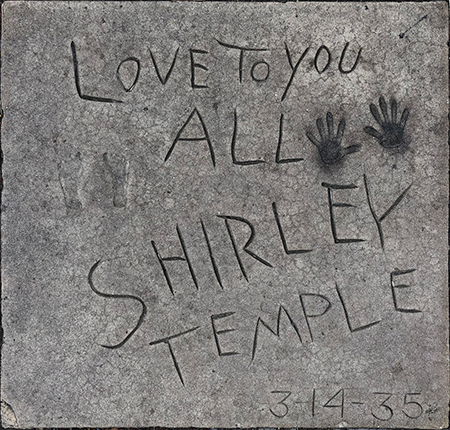 Temple's first films were the Baby Burlesks 1-reel shorts, one of which, Kid in Hollywood (released in March, 1933), where Shirley parodies Marlene Dietrich, had scenes shot in the forecourt of the Chinese Theatre. When Educational Pictures went el-foldo in late 1933, Temple's father was able to buy out her contract for $25. During the Educational period, the studio had the child actors on a relentless schedule of public performances. When Shirley was seen dancing in a theatre lobby by Fox Film songwriter Jay Gorney, he suggested that she try out for a part in a picture he was working on, sort of a review called Stand Up and Cheer! Released in May 1934, Shirley's singing of the song "Baby, Take a Bow" was such a standout, Fox put her in her first starring picture, called — surprise! — Baby, Take a Bow — released in June 1934. Then things got busy. Shirley was loaned out to Paramount to make Little Miss Marker, also released in June 1934, where she co-starred with Adolphe Menjou. With three hit pictures under her belt, the Temple family re-negotiated their Fox contract, who set up a Shirley Temple picture-making machine, cranking out an astonishing number of films before Temple became too old. . . Her first starring role was Bright Eyes (which played the Chinese in December, 1934), in which she sang in immortal tune "On the Good Ship Lollypop." Her fame was such that on the day her next film, The Little Colonel opened at the Chinese Theatre in March, 1935, she was asked to become the youngest person to ever place their impressions in the forecourt, a distinction which seems unlikely to be broken. Being the most valuable asset of the newly-merged 20th Century-Fox studio, chief executive Darryl F. Zanuck placed even more emphasis on grinding Temple pictures out, with nearly all of them playing the Chinese: Our Little Girl (played in May 1935), Curly Top (played in August 1935), The Littlest Rebel (played in December 1935), Captain January (played in May 1936), Poor Little Rich Girl (played in July 1936), Dimples (played in October 1936), Stowaway (played in December 1936), Wee Willie Winkie (played in September 1937), Heidi (played in November 1937), Rebecca of Sunnybrook Farm (played in April 1938), Little Miss Broadway (played in July 1938), Just Around the Corner (played in November 1938), The Little Princess (played in March 1939), Susannah of the Mounties (played in June 1939), The Blue Bird (played in March 1940), Young People (played in November 1940), and Kathleen (played in March 1942) — a total of 18 features in seven years. The Second World War and the coming of adolesence took the wind out of Shirley's sails somewhat, despite turns in Since You Went Away (released in July, 1944), The Bachelor and the Bobby-Soxer (released in September, 1947), and Mr. Belvedere Goes to College (which played the Chinese in May, 1949). Shirley Temple was on hand when Talent Quest winner Charles Nelson was footprinted at the Chinese Theatre on Sunday, April 24, 1949. 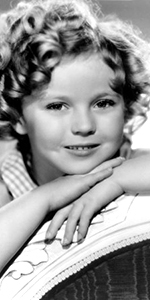 She also had a television anthology show, Shirley Temple's Storybook from 1958-1961 on NBC. Temple had married in 1945, had a child, divorced and become remarried to a Navy man, Charles Black, in 1950. Becoming involved in Republican Party politics, Henry Kissinger gave Black her start in diplomatic circles by having president Nixon appoint her U.S. Representative to the United Nations in 1972. President Gerald Ford appointed her U.S. Ambassador to Ghana in 1974; she was Chief of Protocol in mid-to-late 1976; was in charge of the Carter Innaugural and Ball; and she was appointed US. Ambassador to Czechoslovakia in 1989 by president G.H.W. Bush. After a diagnosis of breast cancer and undergoing a radical mastectomy in 1972, Shirley Temple Black became among the first women to publicly admit her condition. She sat on the board of directors of several corporations, and was involved in many charitable organizations. In adulthood, a long-time closet smoker, Black died of chronic obstructive pulmonary disease in 2014, at the age of 85. Grauman's Chinese Theatre, Hollywood, California. Shirley Temple Forecourt ceremony, Thursday, March 14, 1935. Shirley Temple is assisted in making her footprints by cement artist Jean Klossner and Sid Grauman.